As our wedding is less than a year away(! ), not surprisingly, I have been thinking about my health, diet, and workout plan for the year. 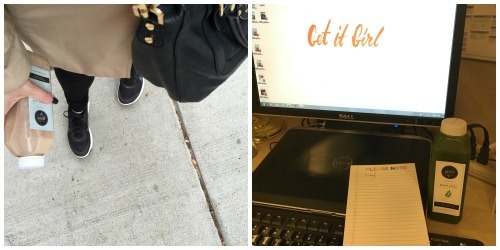 My wedding checklist app even has a task: Make a Fitness Plan. Time to check it off. I want to firm up and get in shape for the wedding; nothing too drastic but just be much healthier and cognizant of what I am eating than I am now. I've tried to stick to a mostly Whole30/Paleo diet but everyone has their slip-ups. 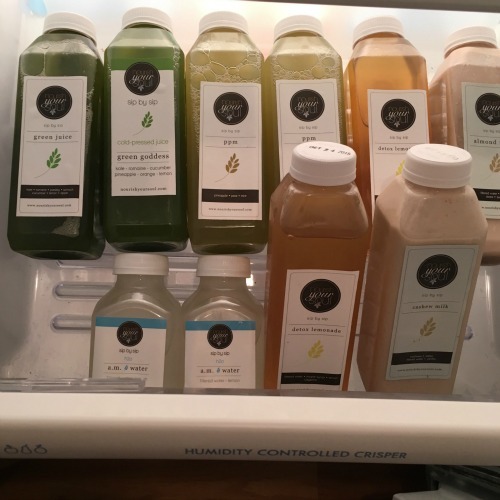 A friend just got married a couple weeks ago and told me she was doing a cleanse in the days before the wedding; I was intrigued and waited to hear her experience. So when Boston-based, cold-pressed juice bar Nourish Your Soul contacted me about trying one of their new cleanses, it was perfect timing. Nourish Your Soul offers 3 different cleanses: purify, nourish, and glow for 1-5 days. 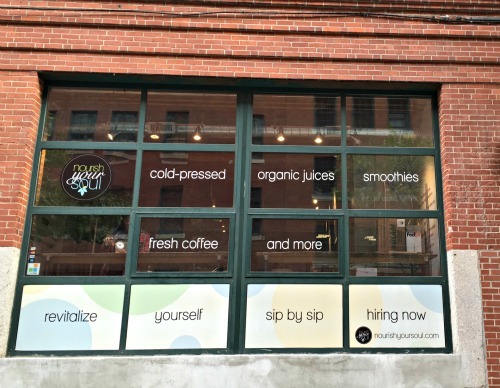 Susan, Nourish Your Soul's owner, met up with me at their South Boston location (1 of 3 locations in the city, Back Bay-ers they just opened up at Healthworks!) to give me the juices, talk more about cleansing, and offer tips. 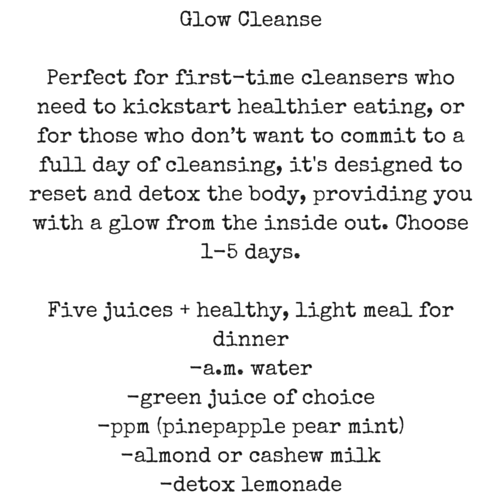 I decided to try the new glow cleanse for 2 days to evaluate for doing again before the wedding next year. I woke up and drank the room temperature (as Susan suggested) a.m. water right away. I like lemon water but this was quite tart. Luckily it's small so down it went... gulp, gulp! Upon arrival at work (about 1 hour later), my stomach was rumbling, just in time to drink the green juice. Let me tell you, this is my favorite green juice I have tried! I don't like parsley (I know, weird) and usually can taste in every green juice and don't like. This wasn't bad at all. An hour later, I made some ginger green tea for a little caffeine. Around 11, I was ready for drink #3, the ppm (pineapple, pear, mint) and it was delicious! Due to a meeting, I had to take drink #4 around 2:30pm and it was supposed to be at 1pm. I was hungry. Drink #4 was the milk; I tried the cashew, that was yummy and satisfied me. The final juice of the day, around 4:30pm, was the detox lemonade. I have hard time describing it because at times I thought it was good, other times too sweet/spicy - overall though, it was the last drink of day 1, so I felt like "yahoo! I made it halfway!" For dinner, I had a salad, as Susan suggested (no meat, dairy, not heavy). My stomach woke me up. I had the a.m. water and quickly was looking forward to the green juice. Susan gave me the green goddess to also try. I also really liked it more than expected (no parsley!). Quickly 11am came around, I was watching a movie in bed (lazy Saturday morning) and the ppm was next. I was already looking forward to the milk as I finished it. But I realized, I felt pretty good and looked leaner in the mirror. Maybe it's just an illusion? Have I mentioned I've peed like 100x since starting this cleanse? TMI? Moving right along... I took the almond milk (I liked the cashew better) on the go while heading to get a manicure. I drank the final juice of the day - and the cleanse - the detox lemonade later than I should have so I was hungry. For dinner a couple hours later, I had a light meal of veggies and rice. Overall I really liked the cleanse as it felt manageable with only 5 juices and knowing the I would eat a real meal every day. I think I could have done 1 more day but that would probably be my limit. The rest of the weekend I felt motivated to eat better as I liked how my body felt during the cleanse. Interested in trying a Nourish Your Soul cleanse or juice? 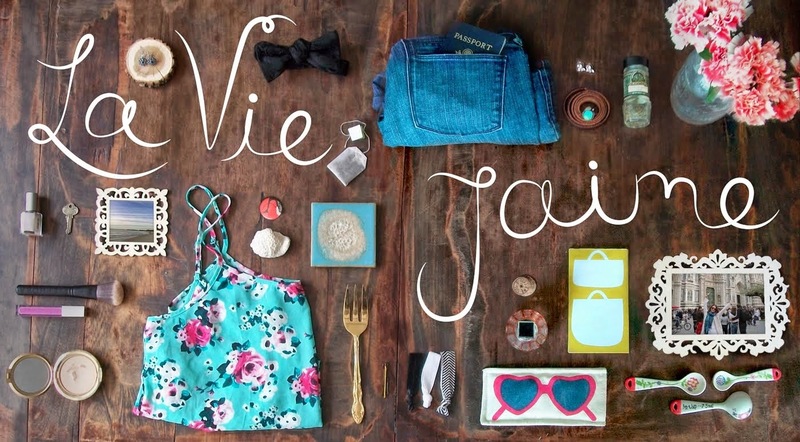 Well lucky for you, Nourish Your Soul is offering La vie Jaime readers 10% off any Nourish Your Soul juice, smoothie, and/or cleanse online only using code: NYSLVJ10. This offer is valid for just 48 hours - hurry and take advantage! Note: using this code only means the purchase has to happen during this 48 hour time, but your cleanse start date can be any time! And - stay tuned tomorrow for an exclusive interview with Susan, Nourish Your Soul's owner! Disclaimer: I was provided a free two-day cleanse. Post idea and opinions are my own. All photos by me. BUT ps. We have a new paleo cookbook coming out at work next month-- remind me to get you a copy!! I like to slip in a green juice as an afternoon pickmeup instead of my old go to - diet coke. and I too can taste any hint of parsley so I'm curious to try these. I have done a "cleanse" where I drank a juice for lunch and had a regular dinner. I basically made up my own version. I think I could handle this for a few days. I assume it means no coffee and no booze?